02.13.09 A Fabulous Night at Planes of Fame , Florence "Pancho" Barnes was one of the most important women in 20th Century aviation. A tough and fearless aviatrix, Pancho was a rival of Amelia Earhart's who made a name for herself as Hollywood's first female stunt pilot. Just before WWII she opened a ranch near Edwards Air Force Base that became a famous -- some would say notorious -- hangout for test pilots and movie stars. Known as the "Happy Bottom Riding Club", it became the epicenter of the aviation world during the early jet age. Chuck Yeager celebrated breaking the sound barrier there in 1947, and Howard Hughes and Jimmy Doolittle caroused in the bar. The Club's destruction by fire in 1953 is seen by many to mark the end of a Golden Era in post-WWII aviation. In the same fashion Pancho herself has become something of a legend, a fascinating yet enigmatic icon whose swagger is often celebrated, but whose story has been largely unknown. Until now. Our fundraiser at Planes of Fame air museum was a resounding success, thanks to the hard work of Andrea Eldridge and the PoF staff! Not only did a sell-out crowd get to see the nearly-completed “Legend of Pancho Barnes”, but we got to inaugurate the brand new PoF movie theatre. In attendance were several special guests, including the museum’s legendary founder Ed Maloney. Ed is responsible for preserving an incredible array of aircraft, including the sole surviving examples of several types. We also had a couple of pilots including Steve Hinton, who grew up near PoF and volunteered there as a child. Nowadays he’s rather famous – although he’s about as modest as anyone you’ll meet – as an airplane restoration expert. He’s also well known as an aerial co-ordinator and pilot for the movie business. That’s a job description that a lady named Pancho Barnes held claim to in the 1930s! 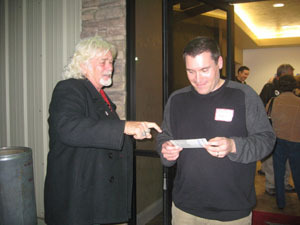 Photos (above): James Lowe shares his latest CD with Nick Spark; (below) an 8x10 publicity photo signed to Joe Nikrent by Pancho, from Nikki Robinson's collection. There were some truly unexpected, special guests as well. James Lowe, a relative of Pancho’s grandfather Thaddeus Lowe, showed up with his wife Pamela. James, who some people know as the lead singer of the seminal L.A. rock band The Electric Prunes, bore a striking resemblance to his great Civil War balloonist ancestor. James brought with him some marvelous family photos, the most interesting of which was an image of Pancho’s brother William. William was a sickly child who passed away while still a young man, in 1913. The photo, which was probably taken just a short time before he died, was carried in a gold locket. The initials of Florence Lowe were etched on the front, and the other side of the enclosure holds a swatch of William's hair. This must have been a special memento that once belonged to William's kid sister, Pancho! 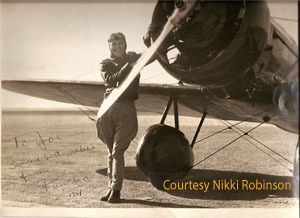 Also in attendance was Nikki Robinson, who showed up carrying a couple of photos signed by our favorite aviatrix. It turns out that Nikki’s great uncle was Joe Nikrent, who served as an official timer for the National Aeronautic Association. Joe officiated at many record attempts, including Pancho’s assault on Amelia Earhart’s women’s air speed mark. In fact the opening of our film has a number of photos of Pancho and Joe on the day of her successful record attempt. Clearly they were pals, and Joe prized the photos enough not only to preserve them, but to pass them down in his family. 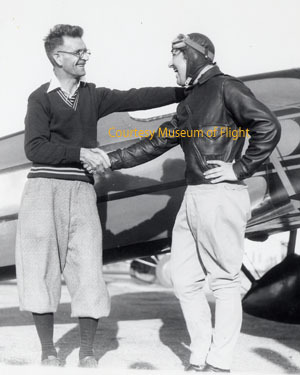 Photo: Joe Nikrent shakes hands with Pancho just before (or maybe just after) her record setting flight in 1931.